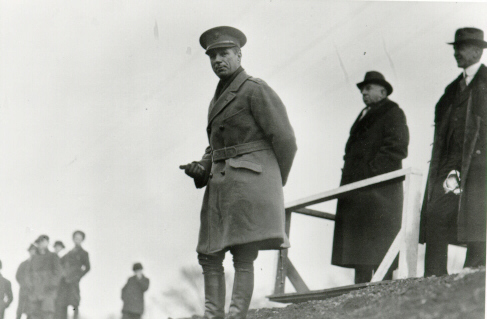 Legendary flyer Orville Wright was on hand to watch Washington's Boy Scouts lay the cornerstone of the nation's first airway on Bolling Field in February 1921. This initial ground marker was 20 feet long and composed of white-washed stones, forming the letters "DC-1," for District of Columbia, Stop Number 1. The event was the first attempt in the history of the United States to mark and chart the highways of the air. General Mitchell was back at Bolling Field to participate in the ceremony. He explained to the crowd of more than 5,000 the importance of the Scouts' cooperation with the government in aiding Army airmen who would be making flights to various parts of the country. Following the end of World War 1, General Mitchell fought for a government-supported system of airways because it was too expensive an endeavor for any one individual, company, or corporation. Also present were Glenn Curtiss and Glen Martin, two of aviation's earliest innovators, and Generals Pershing and Menoher. The model airway served as a vital milestone in the development of both commercial and military aviation. The military had great hopes for the model airway; "rabbit's foot flying" was not the Army way. The original route extended from Washington to Dayton, Ohio, through Moundsville, West Virginia. It was later extended to Langley Field, Virginia, and Mitchel Field, New York, which were designated "operating terminals" with Bolling Field as "control center." Captain Streett, famed Alaskan flyer, was one of the first Model Airway Control Officers. The airway was completed enough for limited use by the summer of 1922 and, in 1926, the route was stretched further to San Diego and Los Angeles, via Dallas. Army and commercial groups used the model airway as a guide to develop six other transcontinental routes, reducing a journey across country from five days to only two. Congress, however, would not loosen the purse strings for air routes, and the Army had no authority to use its current appropriations for airway construction. The model airway operated until Congress passed the Air Commerce Act of 1926, establishing a bureau in the Commerce Department to maintain civil airways and promote civil aviation. Between the period of August 1922 and October 1926, Army pilots had flown over one million miles through the airway, completing 95 percent of all scheduled flights.